The company, Rayton Solar, kicked off a Regulation A+ equity crowdfunding campaign in July. The campaign, which received SEC qualification last month, has garnered more than $7 million in equity reservation investments, according to its founder Andrew Yakub. Since the SEC's qualification last month, the company has received an additional $844,000 from crowdfunding. A 3-micron-thick solar cell produced by Rayton Solar with a particle accelerator, which slices each solar wafer from a crystalline ingot. Bill Nye, the host of the science television series Bill Nye The Science Guy, visited Rayton's Santa Monica, Calif., headquarters and put his name behind the company by producing a video explaining the process of using a particle accelerator to manufacture silicon wafers. Rayton Solar was founded in 2012 when Yakub, then a design engineer at the UCLA Particle Beam Physics Laboratory, saw the need for a less expensive method for producing silicon wafers, the basis for solar panels. Along with working at the University of California, Los Angeles, Yakub was running a solar installation company at the time that relied on a federal grant program that made installing solar cost effective. With the grant program due to expire, Yakub wanted to invent a cheaper and more efficient solar cell. 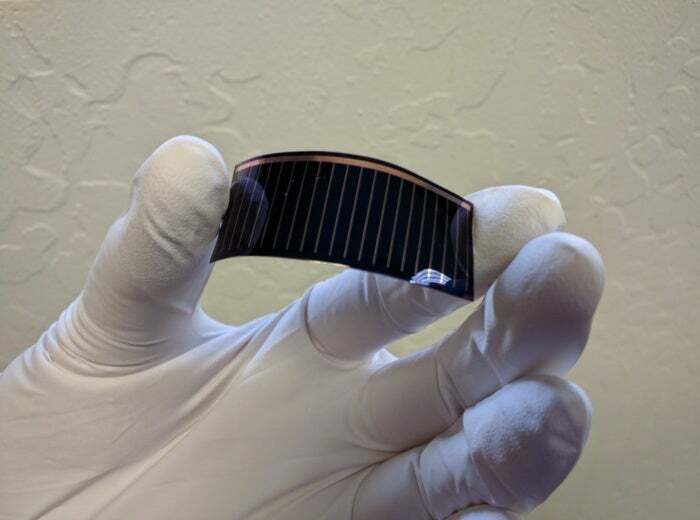 One of Rayton Solar's 3-micron-thick solar cells. The raw material of most conventional solar cells today is crystalline silicon. While silicon is the second most abundant element on Earth, it must first be refined in a furnace at temperatures as high as 1,800-degrees Celsius and undergo other expensive chemical processes before reaching the solar-grade purity of 99.999%, which allows it to collect light that can be turned into electricity. Once in pure crystalline form, manufacturers use diamond saws to slice ingots from the silicon crystal to be used in solar cells, which make up solar panels. The sawing process, however, can turn as much as half of the material into dust, and the silicon wafers produced are up to 200 microns (about .007-in) thick. A six-micron diameter carbon filament next to a human hair, which is about 50 microns in diameter. Rayton Solar claims it can cut electronic-grade silicon into wafers that are just 3 microns thick compared with standard silicon wafers that are up to 200 microns thick. Yakub said he patented a method for slicing silicon ingots using a proton particle accelerator, which produces a wafer just three microns thick and with no wasted material. The proton particle accelerator costs about $2 million, Yakub said. But even with the added expense, manufacturers would still see at least a 60% reduction in silicon wafer manufacturing costs, he said. One particle accelerator, Yakub said, can produce enough silicon wafers to manufacture six megawatts worth of solar cells per year, which is enough to equip about 1,000 homes with solar panels. Thin-film solar cells already exist, but producing them can be costly because of the materials and processes. Today, thin-film silicon cells are already used to make a small number of solar panels. The manufacturing process -- called vapor deposition -- can be slow and more expensive than standard silicon crystalline production. "This employs the use of a growth crystalline substrate where the new silicon is grown slowly on top to 30-50 microns. This method is slow and energy intensive, but also requires the use of 30-50 micron thick silicon," Yakub said. "At Rayton, we use a well-known technique of growing a large single crystalline boule (the ingot) and then exfoliating a thin 3-micron-layer of silicon off of it. We are a 'top down' technique while the vapor deposition methods are a 'bottom up' technique." Tyler Ogden, a solar analyst at Lux Research, said Rayton Solar is developing "a flashy technology, merging two of the hottest applications of physics – particle acceleration and photovoltaic generation – but with dubious prospects." "Their attempt to apply particle accelerator technology currently used for medical applications to cleave a thin wafer from a float-zone silicon ingot is an elaborate solution to reduce silicon waste. The process needs to occur in a vacuum, is likely very energy intensive, and requires a completely novel cell architecture to ensure adequate performance from the thin wafer," Ogden said. Rayton, Ogden continued, is embarking on a "a science experiment that seeks to displace industry standard processes and as such are decades away from commercialization and are unlikely to get there." Yakub, however, said that because the growth of a single crystal ingot is already industrially scaled and produced worldwide, Rayton Solar doesn't experience the same complications from the silicon crystal growth method used in thin-film solar cell production. "And we can ensure that the highest quality of silicon is used in our exfoliation step. Going down to 3 microns from 30-50 microns realizes further cost reductions," Yakub said. One issue that arises from slicing silicon to only 3 microns thick is that its efficiency, or ability to collect light photons, is greatly reduced. Because the slicing technology is so efficient, however, electronic-grade or float-zone silicon can be used, which has a vastly higher efficiency compared with standard silicon used for solar cells, Yakub said. "Float-zone silicon is 10 times more expensive as a raw material, but we use 100 times less of it so therefore it becomes more economical," Yakub said. "So Rayton's process creates solar panels that are 25% more efficient than the industry standard." The type of particle accelerator Rayton Solar will be using to slice silicon wafers. Yakub, whose company is privately held, plans to run the fund-raising campaign over the next year and then license the particle accelerator technology to solar panel manufacturers. "Our plan is to prove this works with one machine at a commercial scale as a proof of concept," he said. "Then we can license the technology out to larger manufacturers."